Calling on wind of spring far away. Arousing emotions to save the society. The tree trunk stands upright under the sky. For flowers on it are like living fires. 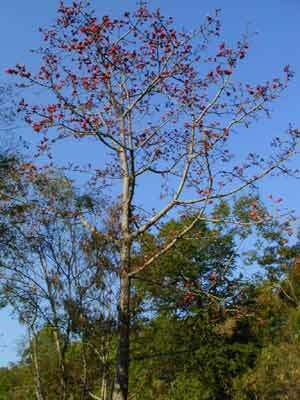 Silk-cotton tree is a kind of tall arbor of ceiba family. The tree grows very big and looks mighty and magnificent. The trunk is upright. The flowers are red and big like plates; when the flowers are in full blossom, almost all the leaves will fall on the ground. Looking from afar, one would feel that they look like flaming fires. Under the blowing of a breeze, the flowers jump up and down, and the scene is extremely magnificent. Therefore, it is always the symbol of heroes since ancient times. The Dai folks of Xishuangbanna make skillful and sufficient use of the silk-cotton trees: in the ancient documents of the Han Chinese, there are many records about the silk weaving of the Dai folks. The raw materials of the silk weaving are the threads of the silk-cotton fruits, which is well known to the people in the middle plains. The fruit threads can also be used to make fibers or willows, which is quite soft and comfortable. On the dining table, dishes made out of silk-cotton flowers appear quite frequently too. Besides, in the love songs of the Dai folks, young girls often praise their loved young fellows as tall silk-cotton trees. Silk-cotton trees grow very quickly. Its wood is light and soft, and can be used to make steam and packing boxes; the flowers, barks, and root skins are usually used as medicines, which have the effects of curing rheumatism. Silk-cotton trees mainly scatter in Yunnan, Guizhou, Guangxi, and South Canton in China; and we can also find their distribution in Vietnam, India and Australia.